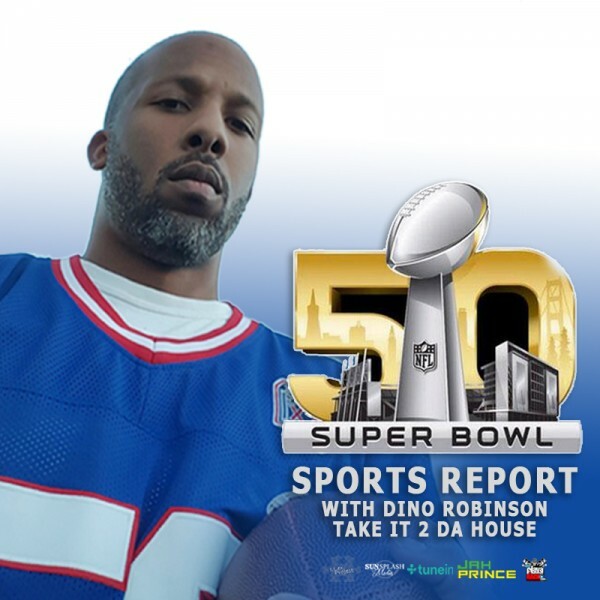 Love Ultra Radio spoke with Dino Robinson, sports blogger of Take It To Da House Sports. Dino catches us up with a special sports update for Super Bowl 50, happening Sunday February 7th, 2016. Find out Dino Robinson’s key notes about both 2016 NFL Super Bowl teams, details about some team players and thoughts about the introduction coin toss. Learn about Peyton Manning current NFL condition, who may be the MVP and some game changers for 2016 NFL Super Bowl 50. Listen to Dino Robinson’s predictions from point scoring to who could win the game, who will be performing during halftime/national anthem and we will see what happens during 2016 NFL Super Bowl 50 with Take It 2 Da House Sports. Follow Take It 2 Da House for the latest sports news. Listen weekly on www.DaFlavaRadio.com for the ‘Sunsplash Mix Show’ Saturday Mornings from 10:00 am to 1:00 pm (Eastern). This show is also heard on AB+L Radio, MovementsRadio.net and in the streets of Gambia on Vibes FM 106.1 & Radio 971 in Dubai (UAE).